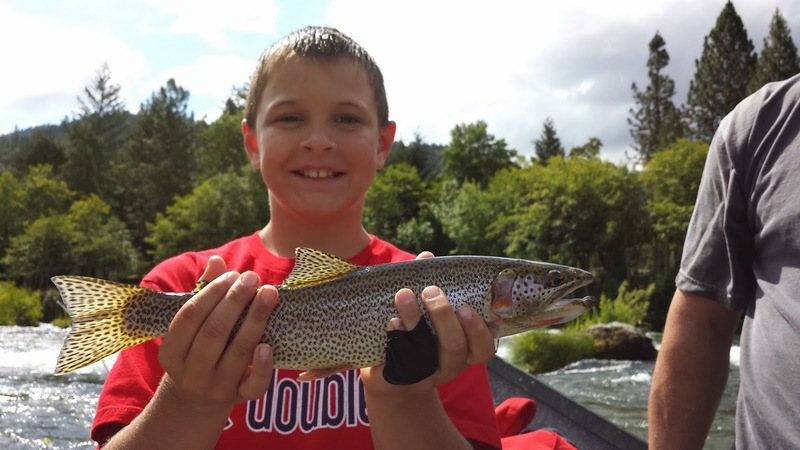 Adam, his wife Pam, along with their sons' Dillon and Ryan had a great trip on the upper Rogue River in early June. 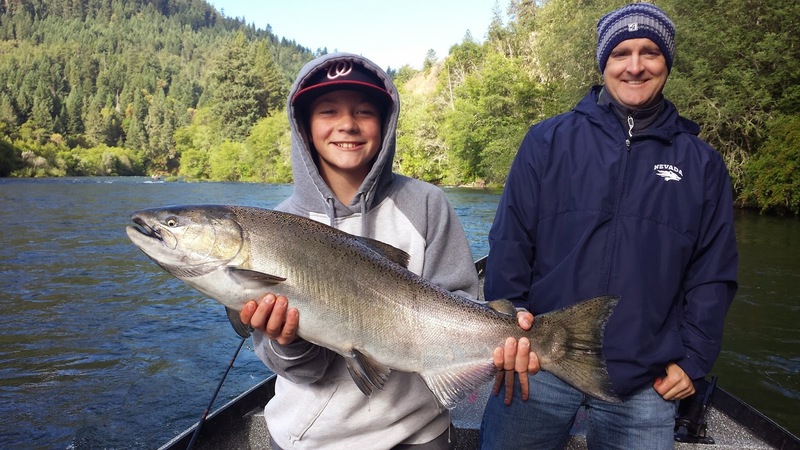 Dillon landed this beautiful 18 pound Spring Chinook Salmon back-bouncing eggs. He got 4 salmon to bite and got 1 fish to the net. Ryan caught himself a trophy sized Cutthroat Trout on the trip that we held up for a quick photo and released unharmed. The tricky technique of Back-bouncing can be learned by anyone with a bit of patience and extreme focus. This fishing family got the method down very well and you can see the results of a good hook set below! I encourage taking your kids fishing and think it's a pretty special thing when parents bring their children on an adventure like this. I have taken kids of all ages fishing and have the patience needed. I recommend starting them out with a 4 hour trip to see how they like it, and if you want to extend the day we can easily do so. My 4 year old daughter loves being in the drift boat and Ryan and Dillon were fine with being on the river all morning. 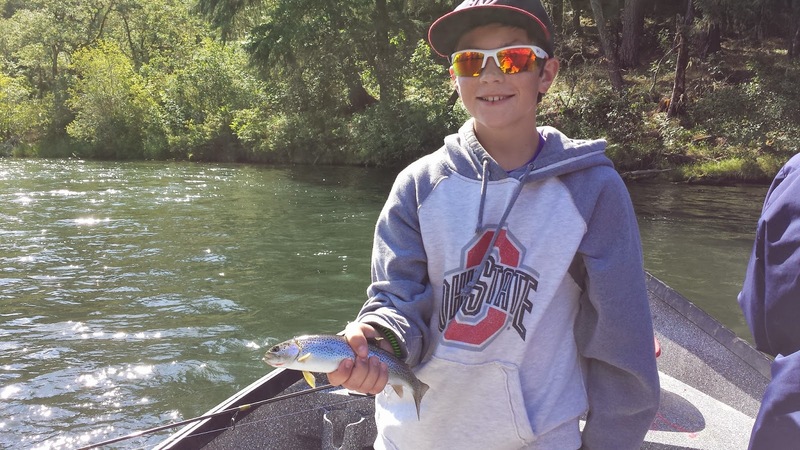 Throughout the day, we also had the trout rods out and were casting spinners (lures) to stay busy. Landing plenty of Cutthroat and Rainbow Trout didn't bother anyone involved. 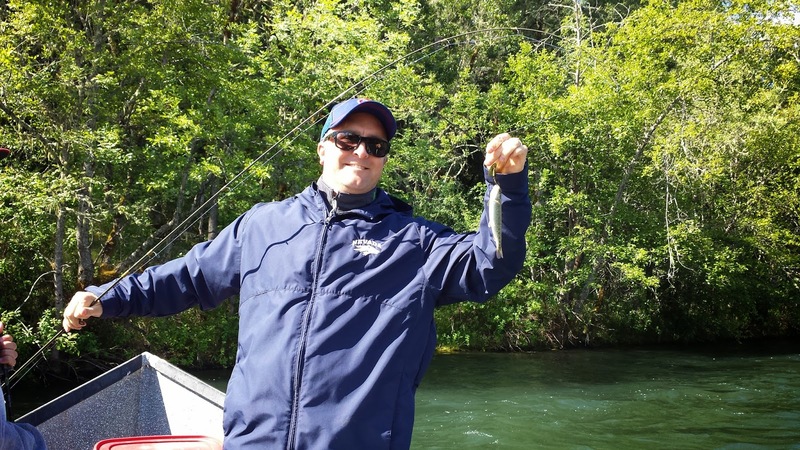 We also heard of 3 Summer Steelhead caught but weren't lucky enough to hook one for ourselves. Plenty of options on the upper Rogue River right now. This fishery never really slows down, we are lucky enough to have multiple species of fish to target 7 days a week, 365 days a year on the Rogue! Give us a call today to book your Southern Oregon adventure...whenever it may be! Dillon shows off a beautiful 18 pound Rogue Chinook! Ryan displays a trophy Rogue River Coastal Cutthroat! More Cutthroat action on the noodle rods! If you look really close you can see Adam's fish!...Haha just kidding buddy! Thanks again for the fun trip, you're the man! 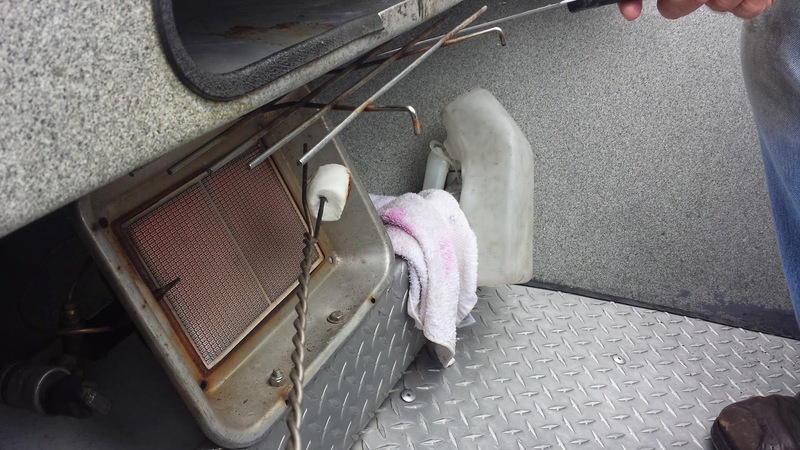 In-between fishing... roasting marshmallows against our drift boat's heater kept the boys plenty busy!